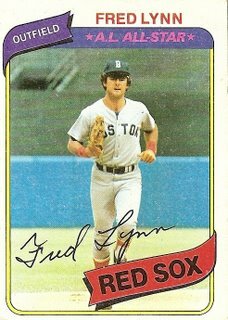 This Fred Lynn card is from 1980, just after the second and final of his great seasons. He was still a young man, just 28 years old, seemingly about to hit the prime of his career. He had already won three Gold Glove awards for his spectacular work in centerfield, had been the first player ever to win the Rookie of the Year award and Most Valuable Player award in the same season, and had in his most recent season come as close to winning the Triple Crown as anyone had since his aging teammate Yaz actually accomplished the legendary feat in 1967. In 1980 he slipped back into the groove of pretty-goodness that had defined his seasons between the great seasons of 1975 and 1979. In 1981 he was traded to the California Angels and hit .219, perhaps trying to once and for all signal his fallibility to his adoring, overly needy fans who kept voting him onto all-star team after all-star team (even while he was hitting .219) and staring at him expectantly as if he was about to blossom for good into some incredible combination of Joe Dimaggio and Ted Williams. In 1982 he began the second stage of his career for real, posting seasons of remarkable sameness and pretty-goodness. His home run totals told the story of this stage of his career the best. He hit 21 homers that first year, 22 the next, then hit 23, 23, 23, and 23 homers the next four years before wrenching himself into hitting 25 homers in 1988. If he hadn’t strained himself and had instead stuck with the usual 23 home runs, maybe he could have stuck around a little longer, but apparently the push for 25 took most of the fight out of Fred Lynn. In 1989 he only managed 11 home runs, and in 1990, long after everyone had finally stopped hoping for the golden Cooperstown version of Fred Lynn to return, Fred Lynn hit his last 6 dingers while clad in a brown and yellow San Diego Padres uniform. I have never seen an image of him in that uniform. I hope I never do. You are currently browsing the archives for the Fred Lynn category.